ATTENTION Better Homes & Gardens readers! Thank you for visiting! Click here to see my gallery of circles, orbs, spheres, and globes in the garden. 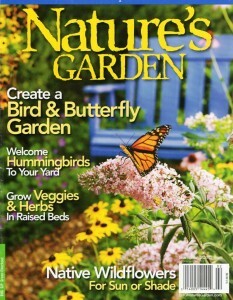 The Summer 2010 issue of Nature’s Garden (a Better Homes & Gardens title edited by the very talented Jane Austin McKeon) features two articles by me. Here’s a sneak peek at those stories. 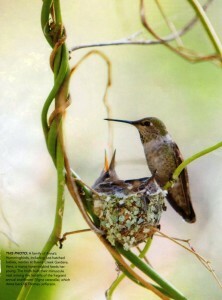 The fist one, titled “Got Nectar?”, is about naturalists and nursery owners Steve and Donna Brigham. The story, produced by Andrea Caughey and photographed by Ed Gohlich, describes how the Brighams created a 1/4-acre Hummingbird and Butterfly Garden at their former nursery in the San Diego area. Buena Creek Gardens is now owned by Steve and Shari Matteson, and you can visit year-round for a great selection of native and wildlife-friendly plants. You can read the full article, here. 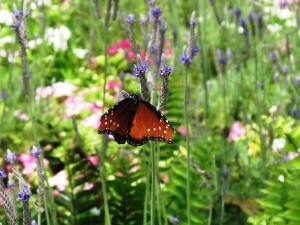 If you’re inspired to attract more hummingbirds and butterflies to your backyard, take a gander down these two lists, shared by Steve Brigham. My second story is part of the magazine’s “Weekend Project” – an easy-to-accomplish design idea created by Patty Roess of the Tree of Life Nursery in San Juan Capistrano, California. 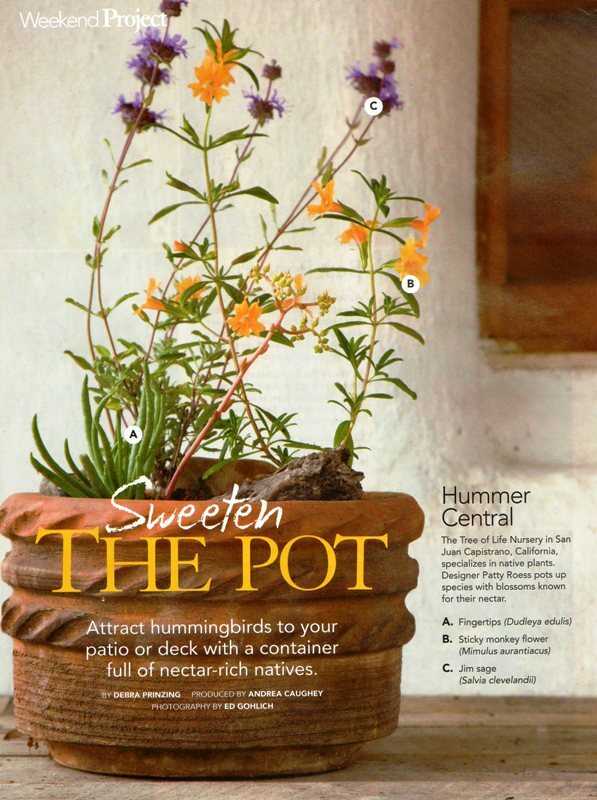 “Sweeten the Pot” includes all the steps you need to attract hummingbirds to your patio or deck with a container full of nectar-rich native plants. native plants with features hummingbirds appreciate (tubular blooms, hot or bright colors, lots of nectar); Tree of Life suggests Dudleya edulis, Mimulus aurantiacus and Salvia clevelandii. 1. Use one or more pieces of broken pottery to cover the drainage hole. 2. Fill approximately 1/4 to 1/3 of the container with high-quality potting soil. Tree of Life Nursery uses a special fast-draining mix developed for native plants. To make your own mix, combine equal parts regular potting soil and commercial potting mix formulated for desert or cactus plants. 3. Arrange plants in the container, placing the tallest plant toward the back. Add soil until it reaches 1/2- to 1-inch below the pot’s rim. Add decorative accents, such as mementos you have gathered in nature. Water thoroughly. In warm climates, you can transplant these California natives to a sunny garden as soon as they finish blooming. This entry was posted on Wednesday, June 16th, 2010 at 10:29 pm	and is filed under Gardening, General, Landscape Design, Plants. You can follow any responses to this entry through the RSS 2.0 feed. You can leave a response, or trackback from your own site. Thank you for letting us know not to miss this issue!